For a consignment store, this can mean anything from not being able to get on the Internet, to your consignment software crashing, to just one or two computers getting ‘unable to connect to database’ errors. In a smaller store, you might only have one computer. 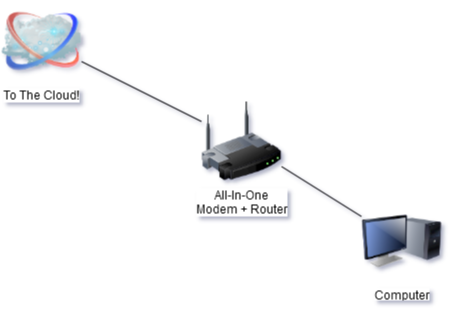 It’s also not uncommon to have an ‘all-in-one’ router/modem combo — i.e. a single box that both connects you to the Internet, as well as providing firewall, network sharing, and WiFi functionality. So here’s what a smaller store’s setup might look like — one computer, plugged-in to the router/all-in-one (even if it’s WiFi, it’s a ‘virtual’ wire), and then to the cloud! Slow Internet or No Internet Connection — Power-off your router/modem by disconnecting its power cable, then reconnecting its power cable. Connection Failures in Liberty — Even if you’re hard-wired to your router, check to see if your computer has a WiFi connection and if it’s on. If so, completely disable the WiFi adapter. Next, let’s move on to a store that has two computers. Contrary to popular belief, the two computers do not *plug-in to each other*. 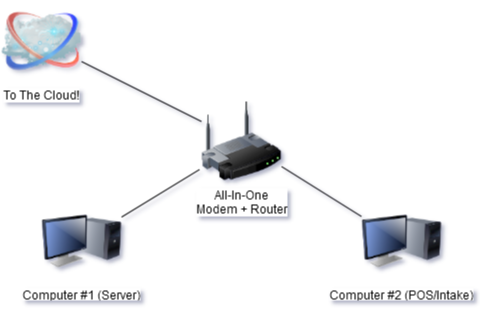 Instead, both of the computers plug-in to a box (your router) and that’s how they share your consignment software’s database, as well as share an Internet connection. One of the most common issues in this kind of setup, is computer #2 cannot open the consignment software/gets database errors. This is because it relies on getting through the network, over to the database that resides on computer #1. If it can’t connect at all, but could *yesterday*, check the network cable — it’s amazing how common a bad/broken network cable is used, which means it slips out of the network jack. Always use network cables that properly clip-in to place — if your network cables can be pulled out without having to press that little, plastic tab, throw them away and replace them. Someone setup your consignment software to point to an IP address, not the server computer’s name. We recommend essentially never using IP addresses — only use the computers’ names. 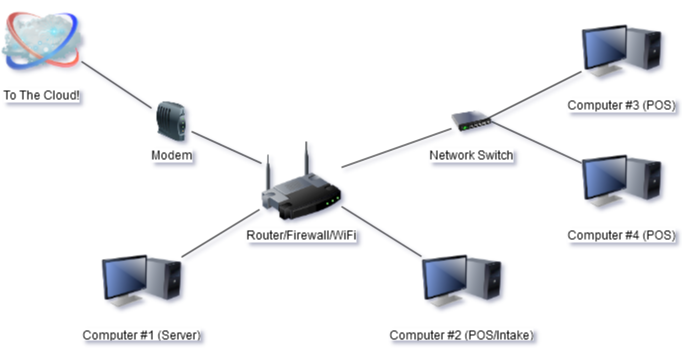 By using an IP address, you’re making a ‘brittle’ setup that can break out of the blue, or if you replace your router. There are only a few circumstances one would ever ‘point’ the workstation to the server’s IP address. The all-in-one has been updated/altered/changed by the ISP, without your knowledge. This happens quite a lot. When you lease an all-in-one from your ISP, they own it, not you. They have access to said device and can (and will) push updates/changes to it. 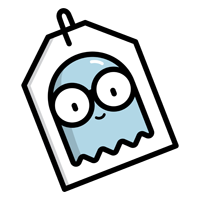 This can lead to your consignment software on the workstation running slowly, or not working at all. For larger stores, or stores with “computers up front” for point of sale, the network layout starts to get a bit more ‘complex’. Basically, instead of all of the computers plugging-in directly to the router, they use an ‘extension’ of sorts — i.e. a network switch. 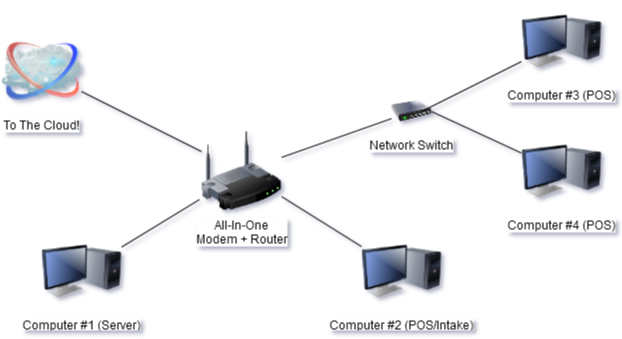 In the setup below, notice how computer #3 and #4 connect to a little box (network switch) and then that box connects to the router. This creates a point of failure — e.g. if that network switch breaks, loses power, or becomes disconnected, then only those two computers won’t be able to get online or open your consignment software. 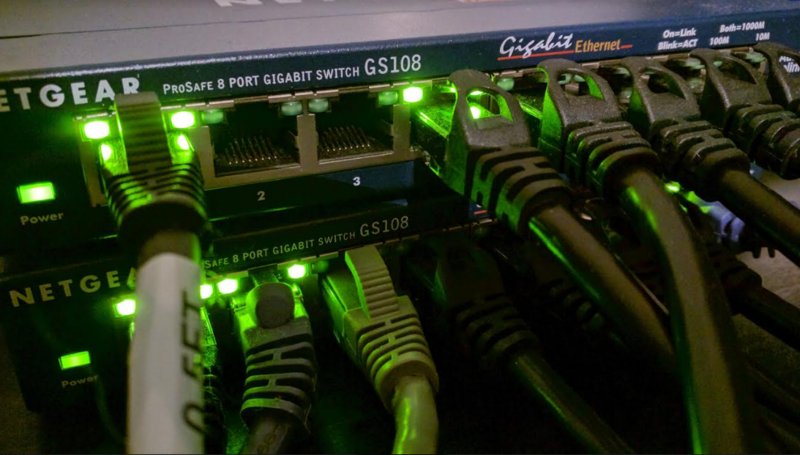 In a setup like this, it’s important to know where that little network switch is, to ensure all of the network cables are new and ‘clip’ in to place, and I’d even recommend putting that network switch on a battery backup. They tend to be lesser devices, which leads to network (and consignment software) slowness. They tend to be unpredictable — i.e. where you’d never see certain issues with your own router, you’ll experience everything from slowness, to internal routing issues. They tend to fail prematurely. They tend to need to be ‘rebooted’ often. By having your own, dedicated modem, it helps alleviate the issues outlined above, but you can also run into issues if the modem loses power — e.g. you won’t be able to get online, but you will still be able to use your consignment software throughout the store. That last one, is really important, because even though most of the consignment programs do not require an Internet connection, Internet-connectivity issues with an all-in-one can prevent your consignment software from running.